This series of programs from Kultur Films presents an in-depth look at some of the greatest women artists of all times. It features spectacular imagery and many rare historical photographs. Geared toward grades 7 and up, each DVD runs 45 minutes. 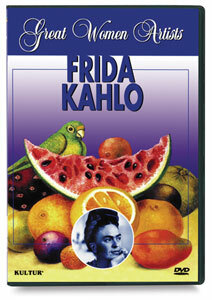 This film examines the extraordinary life and Surrealist art of Kahlo, who began to paint in 1925 while recovering from a horrific streetcar accident that left her permanently disabled. Many of her 200 paintings directly relate to her experiences with physical pain and many also chronicle her turbulent relationship with artist Diego Rivera.